Figure 7.24. Gas core reactor: schematic operation of an open cycle. Figure 7.25. Closed-cycle gas core reactor (conceptual scheme). generated, as in any reactor, must be disposed of (that is, radiated away to space). Thrust available for the Mars mission engine was calculated at 5 x 105 N.
In the "nuclear light bulb'' closed cycle, shown conceptually in Figure 7.25, in addition to the cooling problems a second problem was the reprocessing of the buffer gas (with which core plasma tends inevitably to mix). 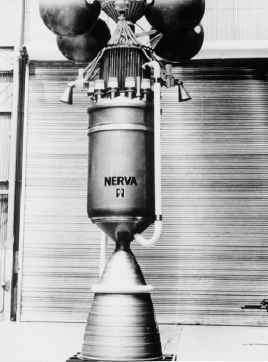 Including a space radiator, the Isp was estimated at 1,400-3,000 s. Thrust was predicted between 1.5 x 105 and 1.5 x 106N. These were encouraging figures; on the other hand, engine complexity resulted in engine mass estimated between 30 and 300 tons, depending on thrust. T = 8,300 K. This flux is worrisome, e.g., 10 to 100 times larger than the heat flux during re-entry from LEO. 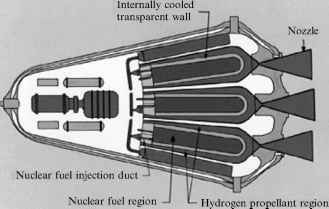 The stagnation temperature of the hydrogen propellant, seeded with 1% tungsten in this reference design, was 6,700 K. Testing of this concept actually took place using UF6 gas (uranium hexafluoride), and replacing fission heating by radio-frequency heating. In these tests the UF6 temperature reached 9,000 K and the heat flux measured was 7.6kW/cm2; the buffer gas was a fluorine-argon mixture. Deposition of uranium compounds on silica was observed to make the silica opaque, but this side-effect was not considered critical to the working of a future engine [Mensing and Latham, 1989]. Russian work on the same two cycles is similar to that in the US, but shows also some interesting differences; among them is the gas maximum temperatures below 8,000 K. Most of the work at Keldysh Research Center was done on the open cycle engine; several geometries were conceptually analyzed, see [Koroteev et al., 2002, Chapter 1]. The reference just cited contains, in fact, a detailed synthesis of the Russian work in gas-core reactors from 1954 to 1975. More recently, work on gas-core engines for a Mars mission has been presented by LASL researchers [Howe et al., 1998]. The emphasis of this work is again on the need to ensure fast round-trip time. While a substantial amount of work is claimed to have taken place toward solving the fluid dynamics problems connected with the core gas-buffer gas interaction [Thode et al., 1997], the estimated mass budget of the spacecraft for a fast Mars mission (270 days, including 40 days on the Mars surface) remains rather substantial at 582 tons. The reason is the relatively low Isp = 3,000 s, and the large engine and shielding mass. The present LASL state of the art of this technology is reported in [Howe, 2000]. New features proposed include the recirculating zone of hot hydrogen plasma shaped as a toroidal vortex by a central (axially directed) high-speed hydrogen jet. Part of the hydrogen jet goes directly to the nozzle, but the largest fraction is fluid dynamically forced to recirculate. The fissioning fuel is injected inside this fraction: in fact, the purpose of the vortex is to confine hydrogen long enough to absorb fission heat. Using its proprietary codes, LASL has reportedly solved most of the plasma and vortex instabilities found in the past. A combustion engineer will find an analogy between this concept and conventional flame-anchoring strategies in a rocket or gas turbine combustor: in both cases the heat release process is faster than the heat transfer to the working fluid, so that recirculation must provide enough time for the heat transfer to occur. Some of the critical gas-core technologies appear to be: heat transfer control, flow control and (in the case of the ''nuclear light bulb''), silica transparency. 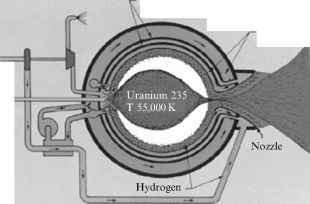 In addition, most of the power generated by gas-core reactors must be radiated away, only a small fraction ending up inside the propellant. This adds the ''space radiator problem'' to an already complex design. On the positive side, gas-core reactors are relatively compact (but heavy) for their thrust level. In the latest version of their design LASL researchers seem to have solved many of the closed cycle problems by doing away entirely with the silica walls, and relying on a pure fluid dynamics anchoring, as in many conventional industrial furnaces. Still, it is apparent that much work would be needed to perfect this ambitious concept.